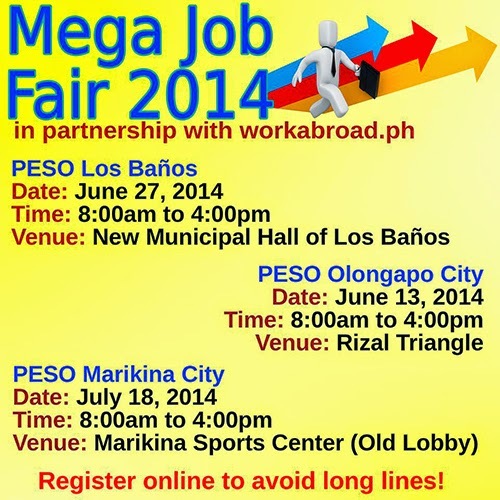 Mega PESO Job Fair 2014 is a series of job fairs coming to Los Baños, Olongapo and Marikina this June and July. In partnership with WorkAbroad.ph, this career expo will come for job-seekers to get easier access to job opportunities available abroad. Pre-register now and download the necessary forms. Don't miss the chance to meet the employers/recruiters in the overseas job market and get hired. Come and join Mega PESO Job Fair 2014 and land the job that can give you a better future! Visit WorkAbroad.ph Facebook page for more details and latest updates.